You would be hard-pressed to name an industry or field that hasn’t been impacted by the rapid advancement of technology in recent years. With similar prevalence, it is undeniable that all humans will be affected by a health crisis at some point in their lives. So it comes as no surprise that through the rapid development of hardware and software – tech has revolutionized our anatomical understandings and continues to provide unprecedented access to medical information and care. But most excitingly, the newly-coined field of medtech – or medical technology – has elevated and made accessible specific aspects of our health that, at one point, we could only come to know through a visit to the doctor. Doctors have – and always will – play a significant role in the delivery of health care. In fact, in Canada, some of our most noteworthy inventions, such as insulin and pacemakers, were created by our country’s finest medical students and doctors alike. But where the times have truly changed, though, is that doctors are no longer the gatekeepers to medical information and innovation. Now, there is an increased number of initiatives and products that are disrupting the current state of health care; from hackathons and bootcamps, to 3D-printed prosthetics and consumer tech gadgets, startups and large organizations across the country are using innovative thinking to revamp how we approach medicine. Large-scale organizations, such as government and private health corporations, however, struggle to integrate innovations on their own. “One of the largest problems that government and large corporations have is that their solutions are often built on legacy systems, and changing them is more costly than is worth the effort,” Joel Muise, CEO and Co-Founder of Tranquility Online, said. Often, it takes collaboration with a nimble startup to build a solution that can lead to real change. 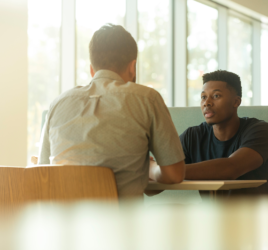 Small startups are typically positioned well when it comes to tackling big problems in health care, because of their agility, lean operations and ability to iterate on a product quickly. According to Canadian Innovation News, there are more than 150 companies and 25 research organizations operating in the Atlantic Canadian bioscience sector, many of which are developing progressive health-related products. There are an exciting amount of companies and initiatives that are creating life-changing medtech innovations in Atlantic Canada. Halifax-based Appili Therapeutics is a drug discovery company that is joining others around the world in the fight against the spread of infectious disease. Over the past few years, the company has been developing a portfolio of anti-infectious drug candidates, which includes compounds such as ATI-1501, ATI-1503 and ATI-1701. Now, a series of letters and numbers may not mean much to the average person, but these compounds could help provide more effective treatment for several serious illnesses; this will be crucial for those who are most vulnerable, like children and the elderly. According to Entrevestor, Appili recently raised $3.6 million and filed its preliminary prospectus with six Canadian securities commissions. Appili is currently in the process of conducting clinical trials on its products, and though it will likely be a few more years before they enter the market, the traction the company has received is a strong indicator of its potential. Founded by Franziska Broell and Andre Bezanson, this startup is on the fast track to success after a major pivot a few months ago. 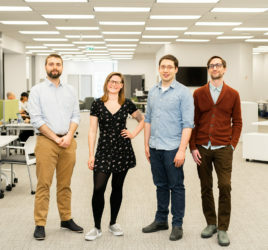 Formerly known as the Maritime Biologgers, Motryx is a Halifax-based medtech company developing a hardware and software solution to help hospitals and medical companies transport blood samples more effectively. Prior to their pivot, the startup was building solutions for various companies using a sensor, focusing primarily on a device that tracked marine species’ movements. Since pivoting, Motryx secured pilot projects with nine European companies, received a $125,000 investment in 10 minutes, was selected as a winner at Pitch@Palace’s On Tour Atlantic event, has expanded their team, and have a lot more exciting milestones in the works. Chinova Bioworks aims to make people healthier and products safer using natural mushroom chitosan to replace unhealthy artificial preservatives in foods and beverages. 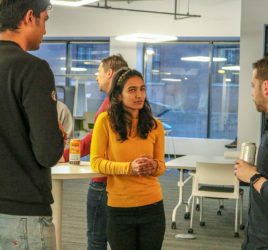 The Fredericton-based company was founded in 2016 by Natasha Dhayagude, David Brown and Tanzina Huq, when the group came together to think about the “preservative paradox”, or how preservatives help reduce food and beverage waste but tend to be bad for our health. The founders realized there must be a better way to increase the shelf life of the items we eat and drink in a way that isn’t detrimental to our health. What’s most interesting about the company’s technology, is their ability to do what other existing solutions can’t. They are able to customize their use of chitosan to target the spoilage microorganisms affecting each product, allowing the company to create variations of the product for different types of food and beverages. Founded in 2013, Sequence Bio is a biotech company, based in Newfoundland and Labrador, that uses genomic data to improve drug discovery. Their goal is to improve the way diseases are treated and medicines are developed. According to Huddle Today, a driving force behind Sequence Bio is the goal of leading a genetic research project called the NL Genome Project, community-based project that aims to create a “powerful drug-discovery platform” to help identify diseases and the drugs that may treat them. Axem Neurotechnology is a Volta Resident looking to add to the world’s arsenal of tech tools that improve our health. Currently, there are limited products on the market to measure brain activity – the ones that do exist are either inaccurate and tedious, or too large and expensive. Clinicians need something fast, accessible and accurate to provide information that is clinically relevant. The startup’s first product, Axem Pro, is in development and aims to empower people to improve their lives with accurate and accessible information about their brains. The product is designed for rehabilitation professionals who work with people to improve mobility. There’s no doubt that 3D printing applications in health care will help millions of people globally. Jacob Boudreau, Founder of Kindness 3D, is dedicated to seeing that those less fortunate experience the positive health benefits of this technology as well. Inspired by a TEDtalk from e-Nable, an organization that acts as a free matchmaker for those who have 3D printers and individuals in need, Boudreau started the Halifax-based project to provide 3D printed artificial limbs to people around the world who would otherwise lack access to affordable prosthetics. Dr. Christine Chambers, a Canada Research Chair and Professor at Dalhousie University, is working on an exciting initiative that seeks to bridge the gap between evidence and practice in health institutions. Based at Dalhousie University and co-led by Children’s Healthcare Canada, Solutions for Kids in Pain (SKIP) will bring together more than 100 partners to transform pain management for Canadian children. If you’re interested in participating in a conversation about health care and innovation, join SKIP at Volta on Thursday, April 18 for a live brainstorm session and reception to celebrate the launch of the initiative and to help inject innovation into health care. Find more information and RSVP on Eventbrite.